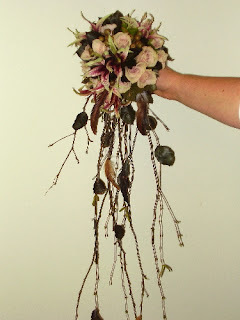 This wasn't your average everday wedding. 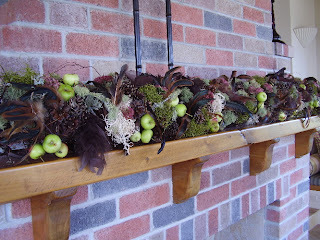 It was very autumny themed - we used feathers and twigs and all sorts of nice warm colours. 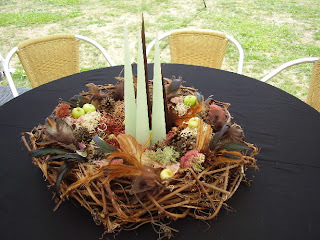 The table centres were cute little nests of pine cones, feathers and lichen, surrounding clusters of chocolatey coloured cone candles. 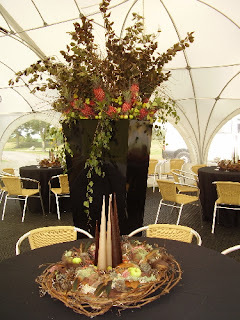 In the back ground, our large black urn filled with red pineapples, birch, copper beech, grapevine and little baby granny smiths.